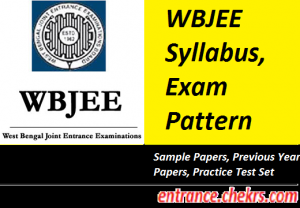 WBJEE Syllabus, Exam Pattern (डब्लूबीजेईई सिलेबस, परीक्षा पैटर्न) 2017: All Students who are interested in getting admission in the engineering classroom courses from the various engineering colleges in the state of West Bengal, they need to qualify the WBJEE with minimum qualifying marks. We are here to facilitate the seekers who are looking for latest charges that are made in WB Joint Entrance Exam Syllabus 2017. The topics that are included in the syllabus of WBJEE, are the topics that are studied in 10+2 standard (PCM) of CBSE/ State board exam. You can also check the complete details regarding the WBJEE Exam Pattern 2017 from the complete details given below. The exam will be conducted in 02 sections, the 01st paper will be of Physics and Chemistry, and the 02nd section will be of Mathematics. The question paper is of objective type and it will be in the English language. There are total 200 questions (Maths: 100, Physics: 50, Chemistry: 50). The time duration provided is 02 Hours for each paper (I & II). All interested candidates who are going to appear in the West Bengal joint entrance exam are suggested to check the subject wise Syllabus of WBJEE 2017 that are described below. The questions are based on 10+2 standard Physics, Chemistry, and Maths syllabus. It is very crucial to know; from which section the question will be asked in the exam. We are concluding in that in WBJEE, the questions will be asked from the Physics, Chemistry and Math Subjects that are included in the syllabus of class 12th. The candidates looking for WB Joint Entrance Exam Pattern 2017 are advised to follow the complete details given below to check the complete pattern of WBJEE. Examination Mode: Offline Mode (OMR Based). There will be 02 papers, 01st is of Physics and Chemistry, and 02nd is of Maths. Marks per Question: 1, 2, 2 marks will be provided for each question in category I, II, III respectively. Negative Marking: 1/4th marks will be deducted for each wrong answer. ( For category-I 0.25 marks and for Category-II 0.50 marks will be deducted). Aspirants will also be able to check the Sample Papers of WB Joint Entrance Exam 2017 in practice to prepare yourself in a much better approach. You can also check WBJEE previous year papers from our portal. It makes us aware of the important section from which most of the questions are asked in the exam. By solving the sample papers, candidates will be able to analyze the strength and weak points, it will help them to improve these weak sections before appearing in the exam. Its a great news for all those candidates who are looking for the WBJEE Syllabus, Exam Pattern 2017. We have included all the necessary information regarding the WBJEE Syllabus 2017 here. The topics that are there in the 10+2 standard (PCM) books of CBSE/ State Board are same as that of the syllabus of WBJEE. If we talk about WB Joint Entrance Exam Pattern 2017 then we want to conclude that there are total 200 questions, each of 01 marks. The total time duration provided to solves the questions in each paper (Paper-I and Paper-II) is 02 Hours each. For any type of assistance, while checking WBJEE Syllabus, Exam Pattern 2017, you are invited to contact us by commenting at the end of the post.